From L to R: KHC Chairman William Summers, former KHC Executive Director Kathryn Peters, and new Executive Director Edwin King. 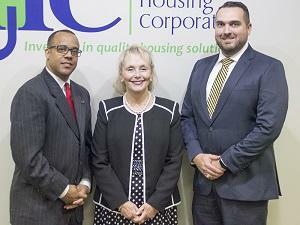 This month, Murray State University alumnus Edwin King succeeds Kathryn Peters as Executive Director of the Kentucky Housing Corporation, the quasi-governmental agency that works to provide housing opportunities for low- and moderate-income Kentuckians. King said he is looking for innovative solutions for affordable housing, as well as extending their partnerships in west Kentucky. King said affordable housing is the foundation for families and children to thrive and have successful outcomes. He said in the past fiscal year, KHC invested $791 million dollars statewide in affordable housing, but only $59 million of that went to west Kentucky. He said there are a lack of volunteers and partners in the region. King said that he wants to look for innovative ways to solve housing problems while solving other problems related to housing. He said he wants to use two programs as the framework for improvement. One of them being Recovery Kentucky and the other being the Scholar House Program. He said the number one solution to homelessness is job creation. He also cited Gov. Bevin’s efforts in reforming the foster care system as a way to aid in housing solutions. King served as a chief of staff in the Finance Administration Cabinet under Gov. Matt Bevin and was Vice Chairman of the KHC before moving into his new position. The KHC will be hosting a “Housing Connect, Collaborate and Innovate Summit” in Hopkinsville on October 19th. King said this event will be a way to listen to potential partners and look for innovative housing solutions. There will be three more summits around the state in Berea, Covington and Elizabethtown later this year. Todd Hatton speaks with the Kentucky Housing Authority's new Executive Director, Edwin King. Officials say annual counts have found 4,025 homeless people living in Kentucky. Kentucky’s rural homeless shelters are finding it difficult to coordinate their services as new federal regulations take effect. The HEARTH Act was passed in 2009, and its regulations for how homeless shelters and transitional housing programs work together are slowly being implemented. New data shows that the number of homeless veterans in Kentucky is on the rise. The increase is partly a result of troop drawdowns in the wars in Iraq and Afghanistan. Beginning in 2009, troops serving in Middle East began redeploying home in large numbers. The number of those having trouble finding work or a place to live increased along with it. Paducah’s City Commissioners took another step toward revitalizing Fountain Avenue during their meeting Tuesday night. They approved a municipal order to apply for a Kentucky Housing Corporation HOME Grant of $308,000. The money will help fund the construction of seven new homes in the Fountain Avenue neighborhood. Mayor Bill Paxton said the neighborhood developed in the 1950’s and has since deteriorated.